First I looked at XCrud… It looked good in the demo, but the back end code was not what I needed… Down 12 bucks. Next I looked at Sximo. It was beautiful, had lots of features. I bought it and, ultimately, it disappointed. Not much documentation, very fragile and rigid. Down 16 bucks. 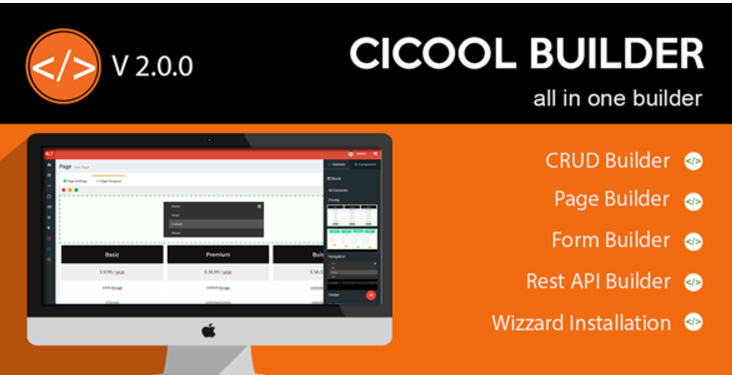 Then I found CICool Builder. Not only did it have a CRUD generator, it has a form generator, page generator, fine grained user permissions, database table generated selects and more. AND it was beautiful. I bought it and couldn’t be happier. It cost me 24 bucks. To get to a great CRUD system, I spent 52 dollars. I just wish I could have given that 52 to the CICool developers. Documentation, rock solid code, decent community, tutorial videos, it has it all. It took me about 4 hours to create a full fledged data management site which includes 10 tables, including lookups, as well as an About page, a contact page, etc. SO…. All this is a preamble to the reason I am posting. One thing that IS lacking is users contributing what they find while working with CICool. I have made a number of customizations to the code and want to put them out there for other users to find and benefit from. Not sure of the impact, but I saw that localhost was being used to include a script. When I installed the 2.3.0 release, I was getting a DB error during the wizard. It appeared that it was attempting to set permissions in the DB. These settings, when done this way are NOT saved after a restart of the server so I doubt this will affect day to day CICool usage, only the install. Note: This should work with the v2.3.0 release but I have seen some strange errors after the changes. I would recommend using 2.0 until this all gets worked out.